“Beethoven Variations.” Ludwig van BEETHOVEN: 32 Variations on an Original Theme in C Minor, WoO 80 (1806); Piano Sonata No. 19 in G Minor, Op. 49, No. 1 (1796-98); Fantasia, Op. 77 (1809); Piano Sonata No. 20 in G Major, Op. 49, No. 2 (1796-98); Introduction, 15 Variations and a Fugue in E-flat Major on an Original Theme, Op. 35, “Prometheus Variations” (1802). Olga Pashchenko (pno). Alpha 201 (1 CD) (http://www.outhere-music.com/). Beethoven wrote variations all his life. Variation sets on popular tunes often helped pay the rent. A gifted improviser, he was known to delight friends for hours if the mood struck. The 32 Variations are firmly rooted in a serious key, and part of this series’ effect is when Beethoven deviates from C-minor. The diminutive pair of two-movement Op. 49 Sonatas pass in a flash, each timed close to seven minutes. They are on the easier scale generally, but Pashchenko doesn’t cut corners. She pulls the Op. 49 pair towards Haydn whereas others might speed past these as necessary obstacles on the way to larger Beethoven sonatas. The Op. 77 Fantasy is an unfamiliar diversion with vigorous, showy bursts. It sounds like aimless improvisation: The first five minutes tease and build up to an unassuming set of restatements or simple variations, not as harmonically or thematically developed as the C-Minor or Prometheus collection. Just when we may expect a serious development, the Fantasy veers back to runs and fanfares. The Prometheus Variations are the most contoured with rubato, ornamentation applied which matches the fortepiano’s resonance. Compared with the C-Minor group, this collection is far more innovative. Not just because some of this material appeared elsewhere, it is easy to hear orchestral aspirations. The exciting fugue nearly strains the instrument. Pashchenko plays a sprightly Christopher Clarke fortepiano modeled after an 1818 Fritz which reveals agility and sensitivity. 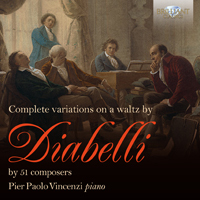 “Complete Variations on a Waltz by Diabelli by 51 Composers.” Ludwig van BEETHOVEN: 33 Variations on a Waltz by A. Diabelli, Op. 120 (1819-1823). Var. Comps: Vaterländischer Künstlerverein (publ. 1824). Pier Paolo Vincenzi (pno). Brilliant Classics 94836 (2 CDs) (http://www.brilliantclassics.com/). Diabelli published the variations on his theme in two parts: Beethoven’s astounding effort and everybody else’s. The other collection is infrequently sampled, but Vincenzi has conquered all of it in published order (alphabetical), concluding with Czerny’s Coda, and extras from two composers who offered more than one variation (Franz Xavier Wolfgang Mozart and Gottfried Rieger – Yes, Franz Xavier is Wolfgang’s son). Most participants are forgotten today, except for Schubert (No. 38), the 11-year-old Liszt (No. 24), the pianists Czerny (No. 4), Hummel (No. 16) and Moscheles (No. 26), and perhaps Frederic Kalkbrenner (No. 18) and Schubert’s friend Anselm Hüttenbrenner (No. 17). 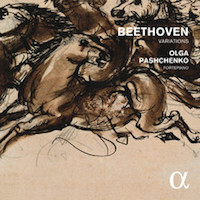 Few variations compare to Beethoven’s, and not just because his effort is prodigious. Diabelli’s theme is inherently fussy, and others’ elaborations sound like pileups, e.g. : Carl Maria von Bocklet (No. 2), Rieger (No. 33), Franz Weber (No. 46), et al. One big exception, already familiar, is Schubert’s heart-stopping bittersweet contribution (No. 38), one of the few minor key contributions. It arrives none too soon, and is an oasis after so much pounding filigree. Another minor-mode effort, No. 34, by Philipp Jakob Riotte, is mockingly operatic as if its composer saw through Diabelli’s simplicity. A calming Polonaise, No. 43 by Václav Tomaschek (or Tomášek), warrants remarking, and Archduke Rudolf (No. 40) does not fare badly with his brittle Fugue. Vincenzi plays enthusiastically. His Beethoven may be quirky in that he slows here and there, or overemphasizes dynamics. I sense that he takes each performance as an exploration. As an entire span, the Beethoven-plus-yearbook is charming fun. 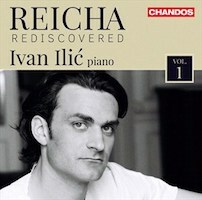 “Reicha Rediscovered, Vol. 1.” Antoine REICHA: Practische Beispiele: No. 20, “Harmonie,” No. 7, “Capriccio,” and No. 4, “Fantaisie sur un seul accord” (1803); Grande Sonate (1805? ); Sonata on a Theme of Mozart (1805? ); Étude, Op. 97, No. 1 (1815-17). Ivan Ilić (pno). Chandos CHAN 10905 (1 CD) (http://www.chandos.net/). Reicha is probably not on anyone’s desert island list. An exact contemporary of Beethoven, Reicha (1770-1836) eventually settled in Paris, and if known for anything today other than his friendship with his more famous colleague, it is for his prodigious quantity of wind quintets. From the start, it’s easy to see why Ilić, who has tackled contemporary works nearer to the Cage and Feldman camp, might be interested in Reicha. The first track, “Harmonie,” from the didactic technical collection, Practische Beispiele, has amorphous harmonies and sounds like a string of examples, not unlike Satie’s Sonneries de la Rose+Croix. The Fantaisie sur un seul accord is an exercise upon the varied ways to arpeggiate or play the notes in an E major chord. The Sonata on a Theme of Mozart bears comparison to Beethoven’s Diabelli Variations only to point out how a different composer might begin with ornamentation, rather than with setting the stage dramatically. It may have been more interesting had Reicha started off with variations that are farther from Mozart and found his way back to the March of the Priests from The Magic Flute. The subsequent movements are not derived from Mozart’s themes. To wrap the Mozart Sonata, Ilić offers a self-standing Rondo, the original finale presumably lost. The C-major Grande Sonate strives: Reicha will use rhythm effectively, but the ideas are hardly memorable. Presumably Ilić will get to the 36 Fugues (which deviate from Bach’s model) and L’Art de Varier, a set of 57 variations. E.T.A. HOFFMANN: Sonata No. 1 in A major (1805); Sonata No. 2 in F minor (1805-07); Sonata No. 3 in F major (1805-07); Sonata No. 4 in F minor (1807-08); Sonata No. 5 in C-sharp minor (1808). Robert SCHUMANN: Kreisleriana, Op. 16 (1838). Luisa Guembes-Buchanan (pno). Del Aguila DA 55311 (2 CDs) (http://luisagbuchanan.com/). Hoffmann’s five keyboard sonatas are solidly Classical, like a conservative early Beethoven, well versed in Haydn and Mozart, and comfortably adapting established forms. Hoffmann is boldly competent, perhaps just a hair or two shy of brilliance. The composer / author produces interesting fugato passages, as found in the Second and Third Sonatas. The Schumann functions as an appendix, comprising 32:58 on a second disc, recorded more conventionally (the 62:26 disc of Hoffmann is more muffled and intimate). Kreisleriana is not at all contemporaneous to Hoffmann’s Sonatas, but is here because its title appropriates the name of Johannes Kreisler, a character who appears in several Hoffmann stories. 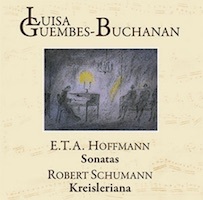 Guembes-Buchanan plays the Hoffmann effortlessly and admirably. There’s a recording of the five sonatas on fortepiano (Wolfgang Brunner, cpo 999 320-2) which is antique by comparison. “Piano Arrangements.” Arnold SCHOENBERG: Gethsemane (1899; arr. SCHOENBERG)1; Gurre-Lieder: Part I: Prelude and Interludes (1900-03; rev. 1911; arr. Anton WEBERN)2; Sechs Orchesterlieder, Op. 8 (1903-05; arr. WEBERN, 1911)3; Klavierstück, Op. 11, No. 2 (1909; arr. Ferruccio BUSONI, 1910)4; Sechs kleine Klavierstücke, Op. 19 (1911)5; Litanei and Entrückung from String Quartet No. 2, Op. 10 (1907-08; arr. Alban BERG, 1921)6; Fünf Orchesterstücke, Op. 16 (1909; arr. Erwin STEIN and WEBERN, 1913)7; Kammersinfonie No. 2, Op. 38b (1906-16; rev. 1939; arr. SCHOENBERG, 1942)8. Claudia Barainsky3,6 (sop), Konrad Jarnot1 (bar), Urs Liska1,2,3,4,5,6,7, Andreas Grau2,7,8, Götz Schumacher2,7,8, Irmela Roelcke2,7 (pno). Capriccio C5277 (2 CDs) (http://www.capriccio.at/). Despite Schoenberg’s innovation and influence, most are hard pressed to identify his masterpieces. Verklärte Nacht may be frequently performed, but as it’s not 12-tone, is it truly representative? Conversely, those in the know talk reverently of A Survivor from Warsaw, the String Trio, the Third and Fourth Quartets, perhaps the Suite, Op. 25, and the obscure Begleitmusik zu einer Lichtspielszene. Despite his pervasive influence, when it comes down to it, scant Schoenberg is standard repertoire. Even in his own day, pieces would often need to be resized and transcribed as a matter of practicality. But then again, arrangements of symphonic works were relatively common, and Schoenberg was able to mobilize students and musicians to make “new music” more accessible through arrangements. The Op. 19 miniatures are the only pieces here which are not arrangements, but they pass in a flash and are a welcome contrast. 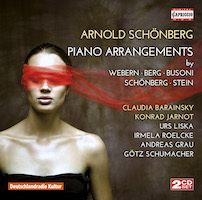 This collection permits hearing Schoenberg’s evolution normalized to the piano, although there are no 12-tone pieces here. The program includes rarities and curiosities, among them the opening Gethsemane and Busoni’s incongruous “concert” expansion of the Op. 11, No. 2 piano piece. Busoni really did enhance Schoenberg’s miniature. The works are offered somewhat chronologically, and we hear the heightened but scrawny Romanticism of Gurre-Lieder, the alternately brilliant and miscalculated Five Orchestra Pieces, and finally the wistful, and perhaps incomplete, Second Chamber Symphony (after revisiting and completing the first two movements begun 30-plus years before, the composer started but never finished a third). This program also highlights that for many reasons (war, exile, etc. ), Schoenberg had trouble completing pieces: Gethsemane is a fragment, Gurre-Lieder had a lengthy gestation, and the Second Chamber Symphony was finalized decades after Schoenberg had made stylistic leaps. The vocal settings include Gethsemane, the rarely heard Orchestral Songs, Op. 8, and the two Stefan George settings, Litanei and Entrückung, plucked from the Second String Quartet. The Op. 8 songs with Barainsky and Liska are wonderful. The songs from the Second Quartet are audibly different in that the voice is appreciably an extra in the original, thus the piano arrangement is an independent summary of characters rather than accompaniment as in Op. 8. The arrangements were achieved by Schoenberg himself as well as his students, foremost among them Berg and Webern. Berg’s Sonata would not have been out of place, although these pieces’ sensibilities definitely represent the more didactic Schoenberg. Erwin Stein and Webern contributed to the Op. 16 arrangement. Stein’s I, II and IV require four players spread across two pianos, Webern’s III and V need two players each at their own keyboard. In this guise it is easy to hear that Fünf Orchesterstücke is a masterpiece.